We often struggle when the product managers, developers, and stakeholders we work with aren't as design literate as we need them to be. When these folks make product and service decisions, they might not realize how it affects our customers’ experience. These decisions can unintentionally make designs worse. During the Creating a UX Strategy Playbook workshop, you’ll learn specific strategies to transform your team’s level of design literacy. With more than 130 UX strategies to choose from, you'll find the perfect ones to embed design education into your team. Our next workshop is November 27-28, 2018 in Manchester, UK. We keep the workshop small, only a dozen or two dozen folks. You’ll get a lot of my attention to help you work through your organization’s biggest challenges, like challenges around design literacy. November’s Creating a UX Strategy Playbook workshop is also special. What makes it special? We’re partnering with ThoughtWorks to host this workshop in Manchester, UK! ThoughtWorks is one of the most experienced organizations at executing smart design. We’ve found their expertise has made them great partners. During the November Manchester workshop, you’ll get a nice, low-pressure way to explore if their expertise would make them a great partner for you and your organization too. I’d love to work with you during our November Creating a UX Strategy Playbook workshop. Let’s work together to identify the perfect strategy combination for your organization alongside the great folks at ThoughtWorks. 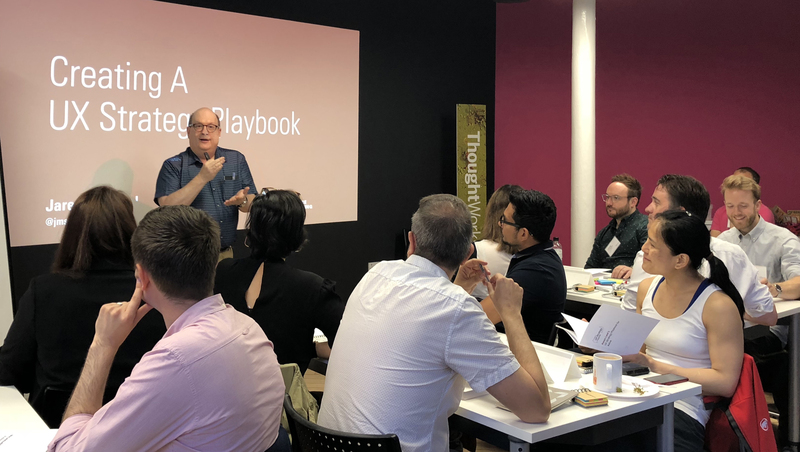 November’s Creating a UX Strategy Playbook workshop in ThoughtWorks’ Manchester, UK office is the perfect place to spend two days focusing on your organization’s UX strategy. Join us in November. We also have upcoming workshop dates in Chattanooga, TN. Check out our December 12-13 and February 6-7.